World Sailing are keen for local companies in each country to manufacture wooden kits or GRP boats, rather than import them as it helps grow the local boatbuilding & sailing industry. The application has to be approved by World Sailing who will consult the National Authority (the body who runs sailing in local country, for example South African Sailing) and the International Mirror Class Association who will ask the local countries Mirror Class Assocaition (if there is one) for their view. World Sailing will then supply the panel drawings which are in AutoCAD format and the wooden boat specification. The drawings are digitized versions of the original 1960's drawings. Kit manufacturers with CNC machines shold be able to produce cutting data for to suit their needs from these. Once you have the drawings the builder should manufacture one kit and have it built into a boat. A further kit should also be manufactured. 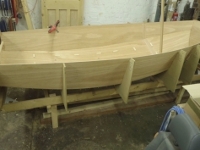 Once the boat is built it has to be measured by an World Sailing International measurer and World Sailing will also want some other documentation (photos, details of timber used,.....). If it passes measurement and World Sailing are happy with it, then on receipt of their licence fee, they will be licenced and can start production. 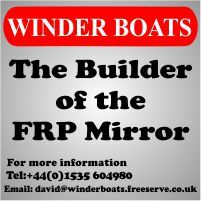 There is a building fee payable to World Sailing for each wooden kit manufactured and when you pay the fee you get the sail number and the World Sailing plaque to stick on the boat.